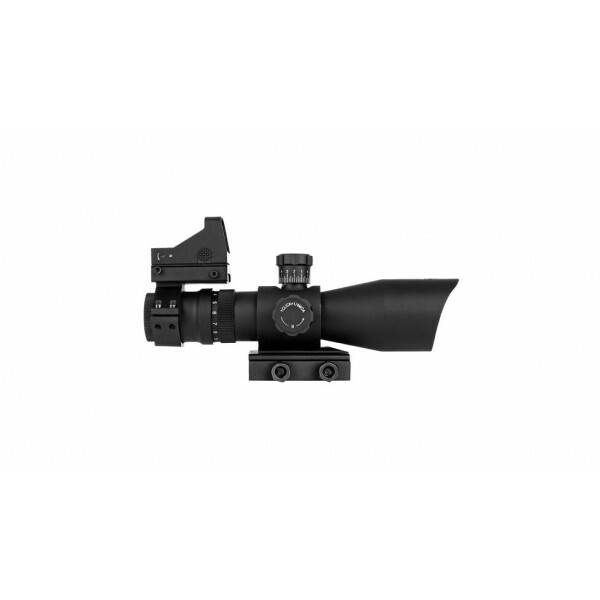 The Redcon is a mid-range optic that offers the flexibility of an all-purpose scope while utilizing three-to-nine power magnification. The tri-illumination reticle ensures target acquisition is optimized in any ambient light level and environment. The body is nitrogen purged for complete water/fog protection and includes a built-in base for lightning fast installation and removal. The integrated sunshade reduces glare and the quick adjust turrets allow for precision when calibrating windage and elevation. This combo also includes a Micro Blue Dot that can be mounted on the rear body segment of the optic.